Morecambe threw away what looked a certain three points after conceding two goals and missing a penalty in the final 10 minutes. 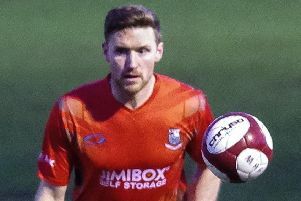 However, a disputed Antony Kay goal halved the deficit on 84 minutes before Tom Pope levelled the scores three minutes later. Straight from the kick-off though, Morecambe earned a penalty when Rhys Oates was felled, only for Leitch-Smith to miss his second spot-kick in a matter of weeks. The Shrimps had made two changes to the starting XI beaten at MK Dons a week-and-a-half earlier. In came Josef Yarney and Liam Mandeville with Garry Thompson on the bench and Andrew Tutte’s calf injury ruling him out altogether. Morecambe dominated the opening 45 minutes and could have been further ahead than their two-goal margin. Vale keeper Scott Brown used his fingertips to keep out free-kicks from Mandeville and Cranston, while Leitch-Smith shot wide and Oswell had more than one effort blocked. The lead eventually came the Shrimps’ way on 27 minutes when they countered from a Vale corner. Jordan Cranston led the charge, running 50 yards before laying the ball across for Leitch-Smith to finish confidently. Thirteen minutes later and it was 2-0 as Alex Kenyon had a shot blocked before crossing the loose ball for Oswell to score from close range. Brown pushed away Mandeville’s curling effort in a second half which saw Morecambe look relatively comfortable despite playing against the wind. That all changed late on when, from a free-kick, Kay was deemed to have beaten the offside trap in firing past Mark Halstead. Immediately from the restart, Vadaine Oliver flicked on a ball forward and Oates was felled by the onrushing Brown. However, the keeper atoned for his error by diving to his right and keeping out Leitch-Smith’s spot-kick to preserve what had looked the unlikeliest of points. Port Vale: Brown, Gibbons, Smith, Rawlinson, Vassell, Oyeleke (Quigley 64), Kay, Conlon, Montano, Pope, Hannant. Subs not used: Hornby, Joyce, Pugh, Dodds, Whitfield, Hardcastle.